How many times have you visited the following places in the past 10 years? This is quite a confusing question to answer for someone who has lived in the Schengen territory on the basis of long-term residence permits for a few years. Am I supposed to list each and every visit I've had WITHIN the Schengen territory? (i.e. if I live in Sweden, should I list all my two-day trips to Norway, all my vacation times in Spain, etc.?) As you are aware, once you are in the Schengen territory, traveling around won't get you more stamps in your passport. So should I only include my entrances to the Schengen territory or should I list all the one-day and two-day trips I have made to nearby countries? So should I only include my entrances to the Schengen territory or should I list all the one-day and two-day trips I have made to nearby countries? Only entrances to the Schengen Area, not to each constituent countries every time you moved around. If you had multiple exits/entries again to the Schengen zone I would list all those entries from Outside the Schengen area. So if I had a residence permit and was living in the Schengen area but travelled to my home country or anywhere else for that matter and came back I would list all such Schengen returns separately even if the basic reason stays the same. I don't think it is confusing at all, specially on the new form. You select Yes for a Schengen Area visit, enter the Month/Year, provide duration which can even be in years and provide a reason ; Residence Permit. Living somewhere != visiting. 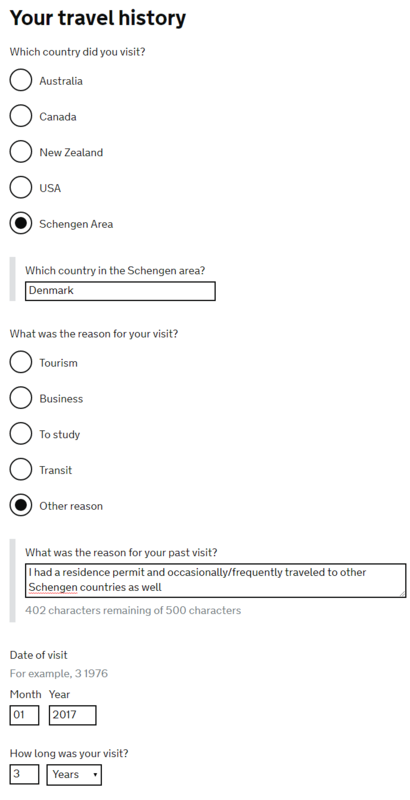 If they want to know about visits, just mention that you've been living in the Schengen area for X years. Not the answer you're looking for? Browse other questions tagged visas uk applications or ask your own question. Frequent business travel to Schengen region - which visa do I go for?